If you are very new to this world of websites then I will take you to the tour of the Google Search Console which will educate you about everything you need to know about this tool. Before we proceed let me tell you that before few years this tool was called as Google Webmasters Tool now the same is being called as Search Console. I told you this because few people may get confused between these two as the might sound different for some people. What Can You Do With the Help of This Tool? How to Submit Sitemap of Your Website? How to Check the robots.txt file? How to Use Fetch as Google? If you want to know more about the search console’s history then you can read that on Wikipedia. Just now we read about this tool now the next obvious question that arises in our mind is what can be done with this tool? I have mentioned few important things that you can do with the help of this tool below, have a look. Check the internal links that you have created for your website. Check and set the Google bot crawl rate. Check the pages that are difficult for Google to crawl and index. Remove content or URL from Google Index. You can write and check how your robots.txt file is working. Access new search appearance features like Rich cards etc. Change address of your website. Add or remove users and property owners. Check how your website is performing in Google SERP. Receive notifications if your website is penalized or any manual actions are applied on your website. Check the Click Through Rate of your website. Know the keywords for which your website is ranking. You can check how often Google bot is visiting your website. You can check the security issues of your website if there are any such. You can check the index status of your website. You can submit the reconsideration request if your website is suffering from any manual actions or penalty. Once you login to the search console you will be allowed to use many features, but to access those features you need to add and verify your website. Don’t worry I will let you know the complete step by step procedure to add and verify your website to the console. 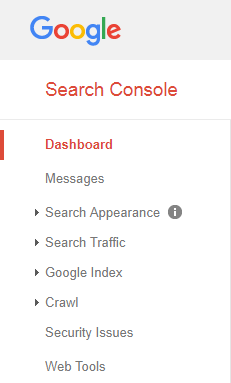 But before that have a look at the features of the search console. Dashboard: This is where you will find the overview of your website’s performance, messages, and status of your website. Messages: This is where you will find the messages regarding your website on the console. You will get a message if there are any critical errors like an increase in 404 pages, expiration of SSL certificate etc. Search Appearance: Under this, you will find structured data, rich cards, data highlighter, HTML improvements, Accelerated Mobile Pages. Search Traffic: Search analytics, Links to your site, internal links, manual actions, international targeting, mobile usability. Security Issues: If your website gets infected by any malware attacks or gets hacked you will find the details about it here which are found by the Google bots. Webtools: Some extra features like ad experience report on the desktop and mobile devices etc. can be found in this section of the search console. To proceed with and add your website to Search Console need to have a Google Account, I am sure you have one with you just sign in to your account first. Now go to Google Search Console, you can follow this link provided here it will take you to Google Search Console in a new tab on your web browser. This tool was previously called as Google Webmaster Tools. Now enter your website URL in the space provided, and later on click on Add you can refer the image embedded below. Google will now as you to verify your ownership to this website property or domain I can say. There are various methods by which you can verify your ownership but I recommend you to use the method which is available in Alternate Methods. The method which I am talking about is verifying by adding HTML meta tag to your website. Click on Alternate Methods and select HTML tag from there, you will get one meta tag from Google copy it to your clipboard. But if you are not using WordPress then you can verify with the help of your Domain name provider, Just select your domain name provider from the drop-down menu and sign in into your domain name provider account. You will be able to verify your ownership. Other than Domain name provider you can even use your Google Analytics account, Google Tag Manager to verify your ownership. And if you are using WordPress as your content management system then it’s very easy, you can do it just by installing a WordPress plugin on your WordPress SEO and the plugin I am talking about is WordPress SEO by Yoast plugin. If you are a beginner and don’t know how you can install the plugin on your blog then you can refer my article, about how to install WordPress plugins. Once you install WordPress SEO by Yoast plugin on your blog click on the SEO which you can find at the sidebar of your dashboard. When you click on SEO the menu will be expanded and you will get various options now click on Dashboard. All the general SEO settings of your website will be displayed to you on your screen. Now click on Webmaster Tools and paste the HTML Meta Tag which you have just copied from Google search console in the space provided and click on Save Changes. Your page will be reloaded and you have successfully added the HTML meta tag on your WordPress website. Now again open the tab of your web browser in which Google Search Console is opened and finally click on verify button which is provided at the bottom part of the webpage. So this was how you can add your website to Google Search Console, I hope you are clear with all the steps I have mentioned above. Now you have added your website to help Google to crawl your website and take into index you should submit your sitemap to Google Search Console. The next thing which I will be telling you is submitting the sitemap of your website to Google. As I have already told you that by submitting the sitemap it will be easy for the Google bots to crawl your website and get it indexed. To get organic traffic, Google or any other search engine should understand your blog and for this sitemap plays a very crucial role. Sitemap connects all the pages, posts and categories which are added by you on your blog. When you submit your Blog sitemap to Google search console it will be easy for the Google crawlers to crawl all the stuff on your blog and take them into their index. Then you can see all your pages, posts etc. in Google search results when you search for them. The first thing you have to do is opening Google Search Console in your web browser and sign in into your Google account. You can use the link which I have provided here to open Search console. Now click on Crawl which you can find in the sidebar of your web interface when you click on that you will be some more options under crawl from there click on Sitemaps. You can refer the image I have embedded below. After that, you can find a red colored button on which you can find ADD/TEST SITEMAP written, click on that you will get space to enter your sitemap URL. Enter your sitemap and finally click on Submit, and you are done with it you have successfully submitted your sitemap to Google Search Console. This was how you can submit sitemap to Google Search console, you can watch my video tutorial which has been embedded below. Before I tell you how you can check the robots.txt file, it is important for you to know the exact meaning and the work of robots.txt file. This is a file which is used by the websites to communicate or talk with the search engine crawlers and tell them what to index and what not to index. You can block the search engine crawlers from crawling and indexing any part of your website by using the robots.txt file. But now you might be thinking why am I talking about the robots.txt in the Google Search Console guide? Is it? Then let me answer your question, I am talking about this because, if Google is not allowed to crawl your website then it will of no use even if you add your website in the search console. So let us check if your robots.txt file allows the Google or no. You can get your robots.txt file by going to example.com/robots.txt just replace the example.com with your website’s domain name. 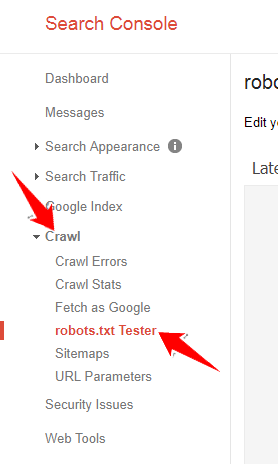 Now, go to Google Search Console and click on Crawl and later on the robots.txt tester. You can check the robots.txt file by following two ways, the first one is by pasting the robots.txt file in the space provided and clicking on submit button. And the second way is by entering the robots.txt URL and clicking on the red colored test button. If you don’t find any errors and warnings then your robots.txt file is perfect and is allowing the Google bot from accessing your website. Till now we saw how you can add a website to Google Search Console, submit the sitemap and check the robots.txt file. And the next thing is to meet the new feature that is Fetch as Google. This is a feature which allows you to submit the posts and pages of your website to the Google’s Index on behalf of Google. Let me be more simple about this, consider that you have published a post on your website on 26 January 2017 12:00 and you want the same post indexed by Google before 12:30. Then what will you do now? You just need to use the Fetch as Google feature and request indexing. In 80% of the cases, the web content will be indexed within 1 minute of using the Fetch as Google feature. But the content which you want to be indexed should meet the quality guidelines given by Google. It is very simple to use the fetch feature of the search console, the steps are mentioned below. The very first thing which you need to do is click on the Crawl from the left sidebar and then click on Fetch as Google feature. Once you click on that you will see the components which you can find in the below image. You have to enter the URL in the space provided and then you have got three options in front of you. The first one to select the type of Google bot (Desktop, Mobile: Smartphone) which you want to use. And the other two things are Fetch along with Fetch and Render, the details about these two are mentioned below. Fetch: Use this option if you want to get only one page or post of your website indexed by Google. Fetch and Render: When you use this option all the pages which are directly linked from the fetched page will be indexed by Google. When you click on any of these two options Googlebot will visit your website and crawl the content of your website. Later on, you will get a Request Indexing button on the screen which you need to click on. In the above image, you can see a status column and the status which you can see there is complete. There are different statuses about which I have mentioned below. Complete: This means Google bot faced no issues while it was crawling your website. Redirected: If you see redirected in the status column then it means that your website is redirecting the Google bot to some other page on or off your website. Not Found: This means that the URL which you have entered is wrong and the bot has received 404 error. Partial: We don’t get this status many times but if you get then it means that some parts of your websites are crawled and some were not crawled. Temporarily Unreachable: We can call this error with another name and that is server request timeout. And you get this error when your website’s server is down. These are the different statuses which you can find while using the Fetch as Google feature. Now let us move further and discuss what you need to do after click on the Request Indexing button. 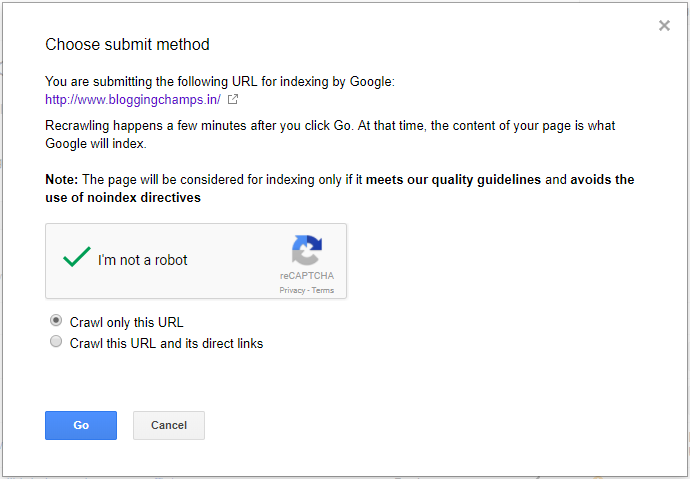 You need to select the submit method, clear the captcha and finally click on Go button, within few movements the page which you have requested to index will be indexed by Google. Backlinks play a very prominent role in deciding the ranks which you get for the content of your website. So it very important to get some quality backlinks for your website. The high the quality of your backlinks will be the high your website will be ranking in Google SERP. Ok, that’s a different topic altogether in this section of my Google Search Console guide I will tell you how you can check the backlinks which you have got for you. Here you should note one thing and that is if your website is very new then you may not find many backlinks for your website in the search console. But as a beginner, you should know how you can check the backlinks of your website here. To check the backlinks which are also termed as external links you need to go to the search console and select the website. After that click on Search Traffic from the left sidebar, you will get a set of options from those options click on Links to Your site. Now You will see three sections in front of you and they are Who links you the most, How your data is linked and Your most linked content let me tell you what these three sections mean. Who links you the most: The domains which are pointing to your website, these domains are arranged in ascending order of the number of links you are getting from them. How your data is linked: The anchor text by which the domains or other websites I can say are pointing to you. Your most linked content: The pages of your websites which have got backlinks pointing to them, even your pages are listed in ascending order of the number of links. So now it’s your turn to decide what you want to check about your backlinks, if you want to check the domains pointing to you then click the more link which is given just below the first section of the page. All the domains will be listed in front of you from which your website has got backlinks from, a whole table will be displayed. If you want to check out the pages which have received backlinks and the anchor text by which you have received links you have to repeat the same steps, just click on the More button below that particular section. Even those two tables (how your data is linked and your most linked content) are downloadable. So this was how you can check backlinks in Google search console, it’s very easy and I prefer checking backlinks from here. But other paid tools are also good to use like Moz’s Open Site Explorer it displays you Domain Authority and Page Authority. So this was my guide about using the Google Search Console for the beginners, I hope you are clear with all the information that is mentioned in this guide. If you have any kind of doubts then you can let me know in the comment section below. Such a useful article for search engine console!!!! As I freelancer blogger I liked your post and way to use Google Search Console. Thanks for sharing and waiting for another useful stuff.